There was a time not too long ago when tattoos had a bad rep that a job applicant had to hide them during job interviews. But thankfully, those days are long dead and gone. Getting inked is now in style that even famous and fashionable celebs like Ariana Grande, Lady Gaga, Demi Lovato and Selena Gomez have them in abundance. Lumos — Grande has the word “lumos” tattooed on the side for her hand, believed to be a reference to Harry Potter’s same-named spell. Lightning bolt — the singer has a lightning bolt tattooed behind her right ear. 561 — if fans are close enough to the singer, they might even notice the number 561 on her right thumb, which is just the area code of her hometown. 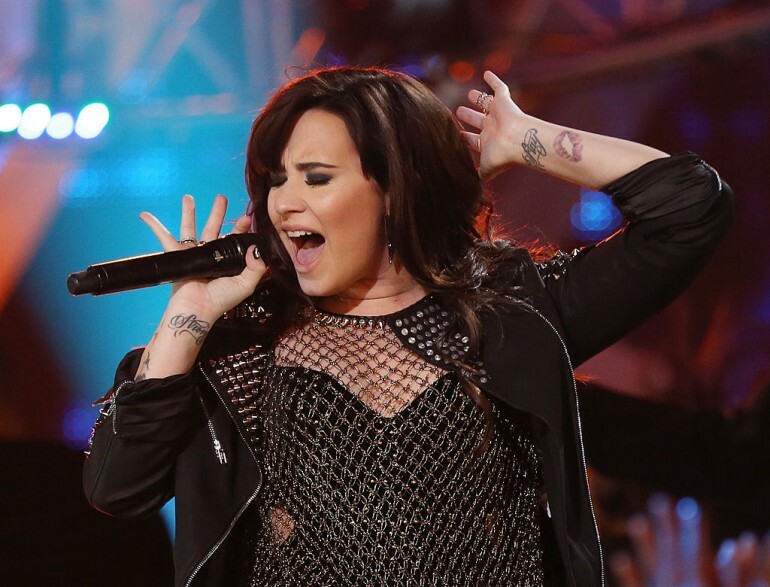 Lion — Lovato has a big lion tattoo on her left hand. It’s actually not that hard to guess why — it’s a symbol of her Leo astrological sign. You make me beautiful — in Lovato’s ribcage area, the phrase “you make me beautiful” is very visible, which are the lyrics to Bethany Dillon’s “Beautiful.” Apparently, it’s a work in progress and has become larger with the addition of some feather and a dream catcher. Rose — there’s also a very visible rose tattoo on her arm. It might also be another work in progress as she recently added another rose, as well as leaves, to the original single rose tattoo. Monster paw — the singer has a huge monster paw tattoo located on her back under her left armpit. It’s said to be dedicated to her fans as it’s a sign of a Lady Gaga devotee. Rainer Maria Rilke quote — there’s a bit of a philosopher in Gaga, which is rather common in artists. “In the deepest hour of the night, confess to yourself that you would die if you were forbidden to write. And look deep into your heart where it spreads its roots, the answer, and ask yourself, must I write?” is tattooed on the inside of her left arm, a quote from her favorite philosopher. David Bowie — Gaga has a Bowie portrait tattooed above her hip. She had it done a month after the legend’s death. Semicolon (;) — Gomez, along with the “13 Reasons Why” cast, had the symbol of the semicolon tattooed. It’s the symbol of the Project Semicolon, a suicide prevention organization. 4 — Gomez had herself inked with the number 4. It’s a symbol of unity for Gomez and three of her closest friends.